(Lancaster, Pa., July 19, 2017) - The Arizona Diamondbacks have purchased the contract of All-Star shortstop Vladimir Frias, it was announced today. He will report to the Jackson Generals of the Class AA Southern League. 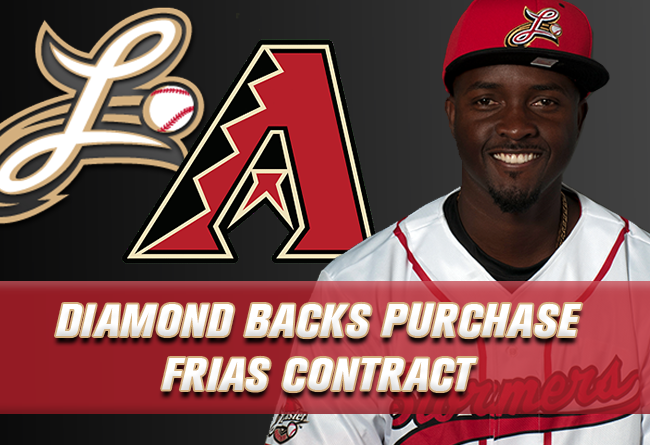 Frias, 30, will be joining a Major League organization for the first time since 2013 when he played at the Class A level for the Boston Red Sox. He was originally signed in 2008 by the San Francisco Giants and also spent a brief amount of time with the Chicago Cubs system. Over the past three seasons, the shortstop had played for the Kansas City T-Bones of the American Association. He batted a combined .279 there, including a peak of .331 in 2015. With the Barnstormers, Frias was batting .277 with five homers and 30 RBI in 74 games. He added 12 stolen bases and was a part of a Lancaster infield that had turned 65 ground ball double plays. Frias and his sometimes double play partner, Garrett Weber, also turned one in the All-Star Game. He becomes the ninth player and sixth position player to have his contract purchased from the Barnstormers by a Major League organization during the 2017 season and the sixth to join a National League West system. The Lancaster Barnstormers are in their 13th season as a member of the Atlantic League of Professional Baseball. Home games are played at Clipper Magazine Stadium in downtown Lancaster, Pennsylvania. Please call 717.509.HITS (4487) or visit www.lancasterbarnstormers.com for more information.